An International Launch Services Proton rocket launches the Yahsat 1 B communications satellite into orbit on April 24, 2012 from Baikonur Cosmodrome in Kazakhstan. PARIS — The Dec. 9 failure of the Breeze-M upper stage of Russia's Proton rocket, the third in 16 months, bears little resemblance to the other two failures and will reinforce a decision by Proton's manufacturer to perform a top-to-bottom assessment of Breeze-M, according to officials with International Launch Services (ILS), which markets Proton launch services. The subsystem-by-subsystem review, which Khrunichev State Research and Production Space Center had agreed to perform after an August Breeze-M failure, is expected to take six to 12 months, they said. It will continue even after Proton returns to flight following the inquiries into the Dec. 9 problem. In a Dec. 13 interview, ILS Chief Technical Officer John Palme and Program Director Jim Kramer said the raw telemetry from the Dec. 9 failure, in which the Breeze-M shut down some four minutes early during its fourth and final burn, will be turned over to independent analysts in Russia for a separate investigation. This review will be done alongside a Russian government-ordered inquiry and a separate, parallel investigation undertaken by Reston, Va.-based ILS. The Breeze-M's large auxiliary fuel tank had been jettisoned after the third burn, as is the case on most Proton flights to geostationary orbit, they said. They specifically disputed an October NASA report saying that the Breeze-M failure in August 2011 left the stage with sufficient stored energy to cause a future explosion. While the Breeze-M in the August 2011 incident left the large AM-4 telecommunications satellite in a useless orbit, it continued to function after the separation of the satellite and conducted the usual venting of fuel tanks that is done to reduce the chance of a future explosion. Three Breeze-M stages have exploded in orbit in recent years, all of the explosions occurring before the auxiliary propellant tank had been separated. The most recent was from the August failure; the Oct. 16 explosion left more than 500 pieces of debris in orbit. Palme and Kramer said a Breeze-M has never exploded after the larger tank's separation. The explosion risk is a concern for the entire space industry because rocket upper-stage failures often occur in highly elliptical orbits where an increase in the debris population poses a danger for other spacecraft. International guidelines call for rocket builders to include in their launch scenarios a sequence in which helium pressurizer and fuel are vented into space to prevent future explosions. ILS and Breeze-M perform this routinely, they said. The Dec. 9 launch carried the 4,500-kilogram Yamal 402 telecommunications satellite, owned by Gazprom Space Systems of Moscow. The satellite was supposed to be dropped off by Breeze-M into an orbit inclined 9 degrees relative to the equator, with an apogee of 35,696 kilometers and a perigee of 7,470 kilometers. Following the unexplained shutdown of the Breeze-M five minutes into its planned nine-minute fourth and final burn, Yamal 402 was left in an orbit inclined 26 degrees to the equator, with an apogee of 35,678 kilometers and a perigee of 3,095 kilometers. Yamal 402 manufacturer Thales Alenia Space of France and Italy, after some initial confusion about where the satellite was dropped off, consulted with Gazprom and then put into place a recovery plan that was to include four long firings of the satellite's on-board thrusters to remove the inclination and raise the perigee. night of Dec. 14-15, after which Yamal 402 — which Thales Alenia Space said was in good health — would arrive in geostationary orbit at its intended slot of 55 degrees east longitude. One benefit of solo launches on Proton is that a satellite owner is able to fill the spacecraft's fuel tanks to the limit because Proton has sufficient power to carry even a topped-off satellite to its destination. That can result in a satellite with a 15-year contracted life operating for 20 years or more. In this case, it could mean Yamal 402 will arrive in its operating orbit with 10 years or more of service life, according to industry officials. Thales Alenia Space declined to speculate on the satellite's expected in-orbit life, saying estimates could not be made until the orbit-raising maneuvers had been completed. Russia's Roscosmos space agency said it expected Yamal 402 to complete its normal in-orbit testing upon arrival in geostationary orbit in time for Thales Alenia Space to hand the spacecraft to Gazprom for commercial operations starting Jan. 8. Palme and Kramer said it is too early to determine when Proton and Breeze-M will return to flight. ILS has a long line of customers awaiting launch, none more anxious than Satmex of Mexico, whose Satmex 8 telecommunications satellite arrived at the Russian-run Baikonur Cosmodrome in Kazakhstan in late November to prepare for a Dec. 28 launch. Satmex 8 will replace the Satmex 5 satellite, which is nearing the end of its fuel supply and is expected to be taken out of service in May, according to the latest fuel calculations made by its manufacturer, Boeing Space and Intelligence Systems of El Segundo, Calif. It typically takes several weeks after launch for a satellite to reach its operating slot, complete in-orbit tests and be declared ready for service. Whether Proton will be allowed to return to operations in time to meet the Satmex deadline will not be known until the inquiries have rendered their judgments, Palme and Kramer said. Television broadcasters and telecommunications operators typically have little patience for service interruptions. A loss of its Satmex 5 customers would be a severe blow to Satmex. The effect of the failure on ILS, one of the world's two principal commercial satellite launch service providers along with Arianespace of Europe, will not be known for some time as the company's customers, and the insurance underwriters who cover potential losses, digest the latest development. Palme and Kramer said they have been assuring their customers that Moscow-based Khrunichev is fully aware of the seriousness of the situation. Whatever the problems turn out to be, Palme said, Khrunichev "is committed to fixing it." ILS officials in the past couple of years have sought to describe the reorganization of Russia's space industrial base, with state-owned Khrunichev as a principal aggregator, as good news for Proton reliability and performance. But the August failure was blamed on a small Breeze-M component whose responsibility had been transferred from Khrunichev to Polyot to Omsk, Russia, which is owned by Khrunichev, as a part of that same reorganization. The component was not manufactured to specifications. 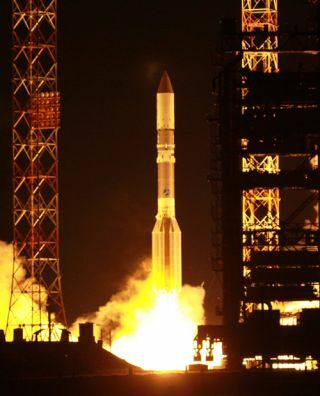 Proton returned to commercial operations within two months of the failure, launching a satellite for Luxembourg- and Washington-based Intelsat in October. The rocket launched a satellite for EchoStar of Englewood, Colo., Nov. 21. Industry officials said Intelsat's decision to put one of its satellites on the first Proton flight after the August failure illustrated the dilemma that many satellite operators face. Choosing to launch when the vehicle was available might be seen as risky just two months after a failure, but a refusal by Intelsat to fly so soon might have placed the company at the end of a long queue of ILS customers, officials said. The Dec. 9 failure is the third for Breeze-M since August 2011. All of them have resulted in the destruction of or reduced operating lives for Russian government and Russian commercial telecommunications satellites despite the fact that ILS has launched several non-Russian commercial telecommunications spacecraft during the same period. Industry officials remarked after the August 2012 failure — involving two Russian-built satellites, one for commercial fleet operator Russia Satellite Communications Co. (RSCC), one a commercial telecommunications satellite for Indonesia's Telkom — that Proton's recent launch history is disastrous for Russian operators, but not so bad for non-Russian ILS commercial customers. RSCC owned the satellite that was lost in the August 2011 failure.